One thing is certain: it felt like Houdini’s work: doing things with hands tied behind my back. I don’t think there was anything I could do in this pre-PowerShell environment that I missed (I chose to avoid VBScript). Some of that is reflected here on this blog, in the series about Scripting Games assignments done using nothing but cmd and build-in tools. My career was going nowhere when I first used PowerShell for work-related task. Even though I’ve heard about PowerShell before, initially I just ignored it. Mainly because having some background in objective C I couldn’t really understand how pipeline can be applicable for objects. Silly me. One day when I needed something that can help me fan-out and fix small problem on number of computers I started to look around and found two scripts: one in VBScript, one in PowerShell. I tried both, but the fact that PowerShell came with REPL made my decision easier: PowerShell it was. You can probably guess what happened next…? History, however, likes to repeat itself. Today I often use PowerShell as an excuse to play with Linux, same as I did in the past. Don’t get me wrong: I’m doing most of my day-job projects in Windows environment and I love it (now that I have PowerShell). But when I’m back home, in my spare time, I like to combine the two. That’s how my series about OMI came to be. That’s why I presented on OMI several time in the past. That’s why my series about Linux DSC is going ‘live’ this week in PowerShell Magazine. Of course I do not plan to stop there. I’m hoping that final version of Linux DSC will be ready sooner rather than later. I’m looking forward for updates to the core technology behind DSC for Linux: OMI. I can’t wait for future releases of Pash. I must say that I hope that PowerShell team will join this effort, especially considering recent news about .NET. 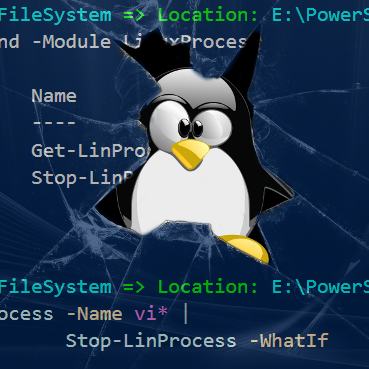 Having PowerShell on Linux would be awesome! Waiting is not all I plan to do. This spring I will present on OMI in Essen: plan to include the core OMI, NetworkSwitch module and introduce Linux DSC. I won’t cover too much ground on DSC side though: Thorsten Butz who will present immediately after me will expand on it in his session. I will probably understand only parts of it (code is international, and my German is close to non-existent), but I’m looking forward to it anyway. I encourage others to join too: there is plenty of good content planned. And with speakers like Bruce Payette, Aleksandar Nikolić, Dr. Tobias Weltner, Jeff Wouters (just to name these I’ve seen presenting before) this conference is doomed to success. And guess where will I spent plenty of time during my preparations for that session…? This entry was posted in PowerShell and tagged Linux DSC, Linux via OMI, PowerShell Konferenz 2015, PowerShell Magazine by Bartek Bielawski. Bookmark the permalink.